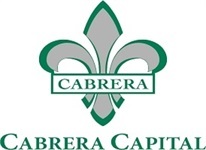 Cabrera Capital Markets’ Equity Capital Markets team is experienced at leading and co-managing offerings of equity and equity-linked securities and providing assistance in placing certain private offerings. Our firm has established trusted and long-term relationships with an extensive number of Fortune 500 companies and has accumulated a great amount of experience on initial public offerings, follow-ons and secondary offerings. 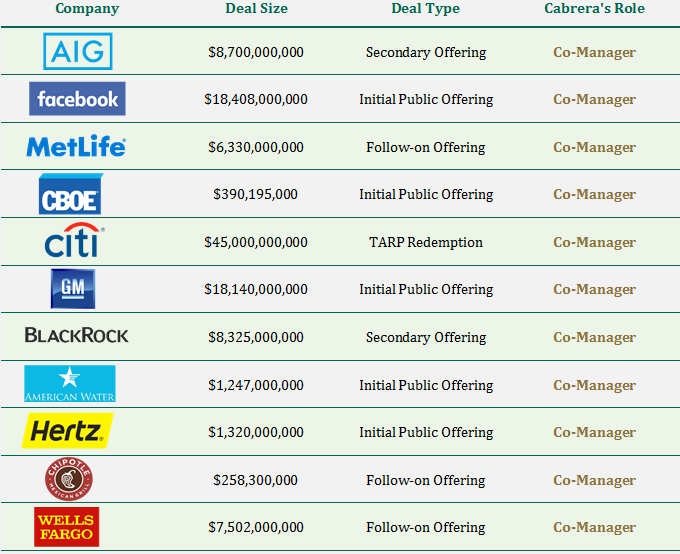 Following are a sample of recently priced primary and secondary equity offerings we have participated in. Our distribution model creates new sources of demand by effectively penetrating second and third tier accounts that have less than $10 billion of assets under management and that may be overlooked by large firms. Cabrera's goal is to aggregate demand by providing our clients with access to both large and small investment entities thereby creating a more diverse investor base. Our firm frequently participates and organizes one-on-one meetings between our clients and the firm’s broad and diverse base of investors fostering knowledge and transparency. Our team of professionals provides our clients-issuers with market insights and distinctive value in the execution of equity offerings. Our equity share repurchase capabilities consist of a skilled trading team with great experience in executing agency-based only open market buyback programs. We are fully compliant with regulatory requirements of 10b-18 and 10b5-1, and we provide a customized service and consistent execution for all listed and OTC stocks.